Asparagus season is on it’s way out around here. It will probably be gone in a week or two. I was feeling like I hadn’t quite had my fill yet, so today I picked up one last bunch to eat with the first of the peas and a few other garden pickings. The asparagus isn’t quite as sweet and tender as it was a month ago, but the peas more than make up for it. They are like candy. This isn’t really much of a recipe, so feel free to substitute whatever spring vegetables you’ve got. You really can’t go wrong. The vegetables will cook very quickly, so put your pasta water on to boil before you do anything else. Cook the pasta until al dente. Meanwhile, melt the butter in a saute pan over medium-high heat. Add the garlic, asparagus, and sugar snap/snow peas and a splash of water, and season with salt and pepper. Let these vegetables cook for 3 or 4 minutes before adding the shelled peas and kale. Cook for another 3 or 4 minutes, until the asparagus is tender but still a little crisp. Remove from heat and stir in the lemon zest and cream. At this point the pasta should be just about done. Drain the pasta but don’t drain it too well. Leave a bit of water clinging to it. Add the pasta to the vegetables in the pan and stir in the grated cheese over low heat. Add a little more cream if you think it needs it. 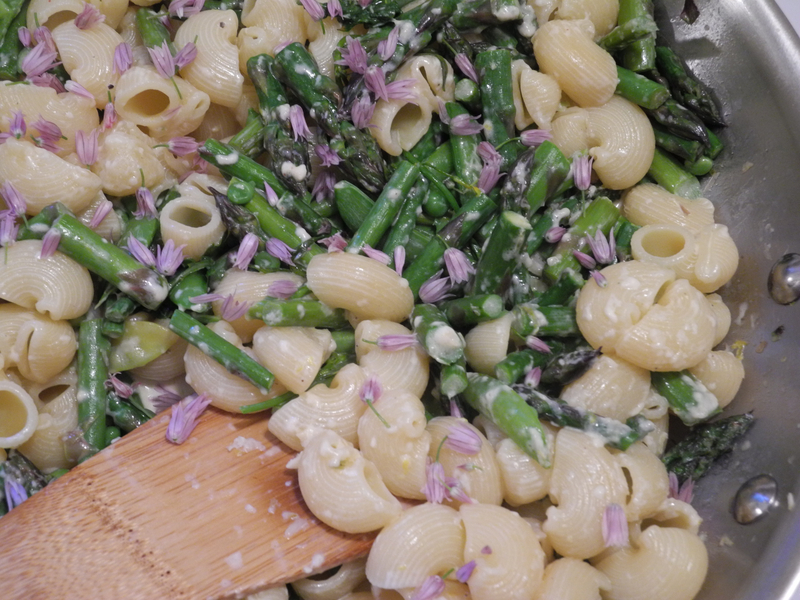 Sprinkle the chive blossoms over the pasta just before serving. Posted on June 4, 2013 by kate. 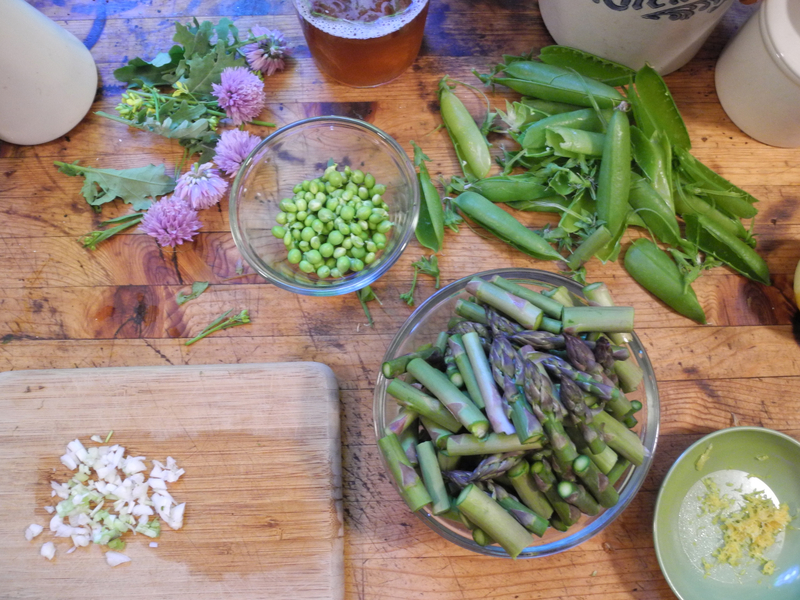 This entry was posted in Cooking, Gardening and tagged asparagus, chive blossoms, cooking, edible flowers, gardening, kale, pasta, Peas, recipes, spring. Bookmark the permalink. Beautiful flavors and all the colors of spring! Sounds great! I’m not sure I’ll be lucky enough to overlap asparagus and peas but thanks for the advice about just using what you’ve got–that I can do! Looks and sounds wonderful. Our garden did the same thing in the past two weeks. 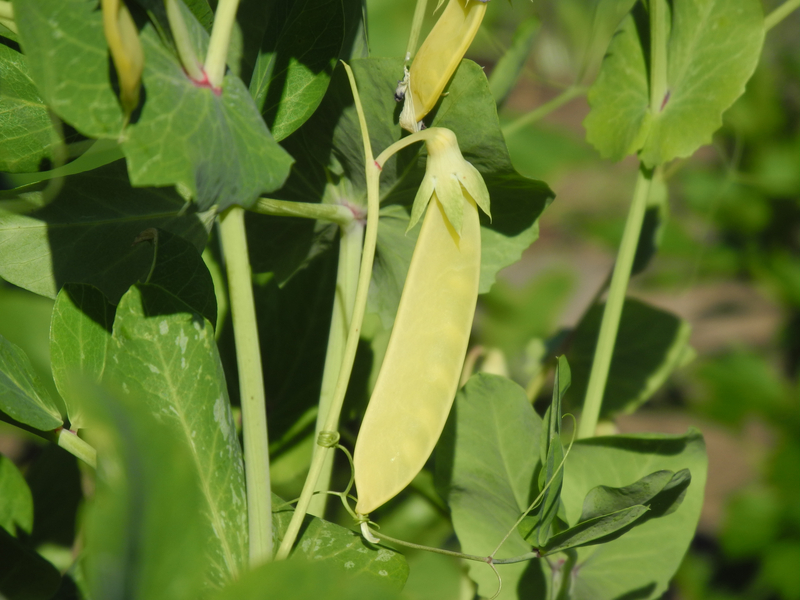 Soon we’ll be rolling in peas. I blanched and froze 9 bags of spinach several days ago. Tonight we’ll have the first of the broccoli. Great time of year, isn’t it? looks delicious!! yeah for spring time foods!! I love that type of meal and the chive blossoms make it look beautiful.